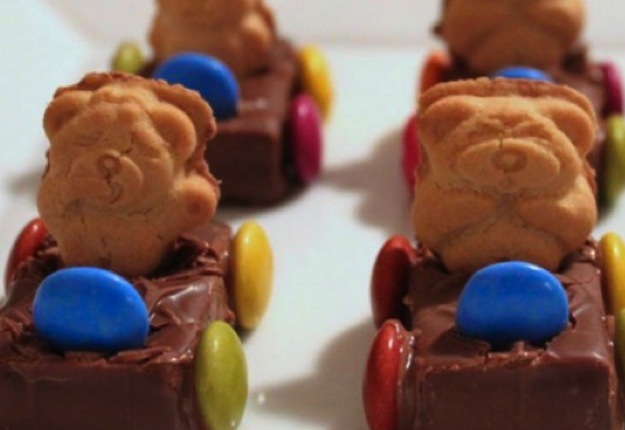 These teddy cars are always a hit at children’s parties! Get your Mars bars and stick a tiny teddy in each. Stick a Smartie in the Mars bar in front of the teddy as a steering wheel. With icing squirt 4 dots on the side of each Mars bar and stick smarties down on icing these are the wheels. Ha ha this is so cute I agree this is good for parties, so sweet! Great for kids parties. Fun idea. Thanks. How clever, these are so cute. Thank you. These are awesome but you can’t stop at just one! These are so very cute – kids must love them. A great idea filled with creative inspiration; thanks for sharing!.